European comet probe. European comet orbiter/landing mission. Comet orbiter and lander (Mars and Asteroid fly-by) satellite built by Astrium for ESA, International. Launched 2004. Status: Operational 2004. First Launch: 2004-03-02. Last Launch: 2004-03-02. Number: 1 . Payload: 159 kg (350 lb). Gross mass: 2,900 kg (6,300 lb). Unfuelled mass: 1,322 kg (2,914 lb). Height: 2.80 m (9.10 ft). Diameter: 2.00 m (6.50 ft). Span: 32.00 m (104.00 ft). Global characterization of asteroids, including determination of dynamic properties, surface morphology and composition. Rosetta took its name from the Rosetta Stone, an inscription discovered during Napoleon's Egyptian campaign. The inscription provided the same message in three languages and provided the key to deciphering ancient Egyptian hieroglyphs. The Philae lander weighed 90 kg and carried the SD2 sample drilling and distribution device. The mission would be controlled from the European Space Operations Centre (ESOC) in Darmstadt. Communications would be via ESA's 35 m ground station at New Narcia, near Perth, Australia, with additional support during near-Earth phases from the ESA 15 m ground station in Kourou. Rosetta is European Space Agency (ESA) Horizon 2000 cornerstone mission number 3 designed to rendezvous with Comet 67 P/Churyumov-Gerasimenko, drop a probe on the surface, study the comet from orbit, and fly by at least one asteroid en route. The principal goals are to study the origin of comets, the relationship between cometary and interstellar material and its implications with regard to the origin of the solar system. Its scientific objectives to achieve these goals are: global characterization of the nucleus, determination of dynamic properties, surface morphology and composition; determination of the chemical, mineralogical and isotopic compositions of volatiles and refractories in a cometary nucleus; determination of the physical properties and interrelation of volatiles and refractories in a cometary nucleus; study of the development of cometary activity and the processes in the surface layer of the nucleus and the inner coma (dust/gas interaction); global characterisation of asteroids, including determination of dynamic properties, surface morphology and composition. Rosetta's design is based on a box-shaped central frame, 2.8 m x 2.1 m x 2.0 m with an aluminum honeycomb main platform. Total launch mass is 3000 kg including the 100 kg lander and 165 kg of scientific instruments. Two solar panels, 32 square meters each, extend outward from opposite sides of the box, spanning 32 m tip-to-tip. The spacecraft consists of two primary modules, the Payload Support Module (PSM), which holds the scientific instrumentation and two payload boom deployment mechanisms in the top part of the frame, and the Bus Support Module (BSM), which holds the spacecraft subsystems in the lower part. A steerable 2.2 m diameter high-gain parabolic dish antenna is attached to one side, and the lander will be mounted on the opposite side. The science instrument panel is mounted on the top and designed to be facing the comet continuously during orbit while the antenna and solar panels face the Earth and Sun. Radiators and louvers are mounted on the back and side panels which face away from the Sun and comet. In the center of the spacecraft protruding from the bottom is a vertical thrust tube made of corrugated aluminum with strengthening rings. The thrust tube provides the propulsion for primary maneuvers and contains two 1106-liter propellant tanks, the upper one containing propellant and the lower one oxidizer. A total of 660 kg of propellant (bipropellant monomethyl hydrazine) and 1060 kg of oxidizer (nitrogen tetroxide) is necessary to provide 2200 m/s delta-V over the course of the mission. The launch mass of the craft including fuel is 2900 kg. There are also four 35-liter pressurant tanks. The spacecraft will be three-axis stabilized and the orientation controlled by 24 10-N thrusters. Attitude is maintained using two star trackers, a Sun sensor, navigation cameras, and three laser gyro packages. Power is supplied by the solar arrays, which will be composed of low intensity, low temperature Si or GaAs solar cells. These will provide 400 W at 5.2 AU and 850 W at 3.4 AU, when comet operations begin. Power will be stored in four 10 Ahr NiCd batteries which will supply the 28 V bus power. Communications will be via the high-gain antenna, a fixed 0.8 meter medium-gain antenna, and two omnidirectional low gain antennas. Rosetta will utilize an S-band telecommand uplink and S- and X-band telemetry and science-data downlinks, with data transmission rates from 5 to 20 kbits/s. Communication equipment includes a 28 W RF X-band TWTA and a dual 5 watt RF S/X band transponder. On-board heaters will keep the instrumentation from freezing during the period the spacecraft is far from the Sun. Total scientific payload mass is roughly 150 kg. 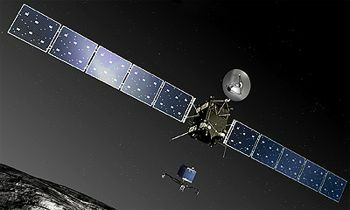 Rosetta was launched at 07:17 UT on 02 March 2004 on an Ariane 5 G+ from Kourou, French Guiana. The spacecraft entered heliocentric orbit and had an Earth flyby and gravity assist on 4 March 2005. A Mars flyby/gravity assist followed on 25 February 2007, and two more Earth gravity assists on 13 November 2007 and 13 November 2009. In between these Earth flybys, on 5 September 2008 at 18:58 UTC, Rosetta flew within 800 km of asteroid 2867 Steins at a relative velocity of 8.6 km/s. Steins is a main belt E-type asteroid 4.6 km in diameter. After the second Earth flyby the spacecraft entered the main asteroid belt for the second time and flew by asteroid 21 Lutetia at a distance of 3000 km and a speed of 15 km/s on 10 July 2010. Lutetia is a large asteroid, about 100 km in diameter. The spacecraft entered a hibernation phase in June of 2011. On 20 January 2014 Rosetta came out of hibernation and began its rendezvous manuever for Comet Churyumov-Gerasimenko in May 2014. Rosetta made its rendezvous with the comet on 6 August 2014. The rendezvous maneuver lowered the spacecraft velocity relative to that of the comet to roughly 25 m/s and put it into the near comet drift phase. Some time after this observations of the comet and the far approach trajectory phase will start. At the end of this ~90 day phase, the relative velocity between Rosetta and the comet had been reduced to 2 m/s, at a distance of about 300 comet nucleus radii. At this point landmarks and radiometric measurements were used to make a precise determination of spacecraft and comet relative positions and velocities and the rotation and gravity of the comet nucleus to fine-tune the approach. This information was used to start orbit insertion at about 60 comet radii distance at a few cm/s. At about 25 comet radii a capture maneuver closed the orbit. Polar orbits at 5 to 25 comet nucleus radii were used for mapping the nucleus beginning in August 2014. Using the information gathered from orbit, a landing site was chosen for the Philae lander. An ejection mechanism separated Philae from the spacecraft with a maximum relative velocity up to 1.5 m/s in November 2014. The lander hit the surface at a relative velocity of about 1 m/s at 15:34 UT on 12 November 2014, but the thruster and harpoons failed and it bounced twice before coming to rest in a shaded area. It transmitted data from the surface to the spacecraft, which relayed it to Earth, until the battery gave out. Last transmission ended at 00:36 UT on 15 November. Eight intermittent contacts were made between 13 June and 9 July 2015. The increased heating of the comet forced Rosetta to raise its orbit to a safe distance from the comet nucleus. Following perihelion in August 2015, as the comet moved away from the Sun activity began to diminish and Rosetta was able to lower its orbit. It moved to a 170 km periapse on 12 November 2015. Contact with Philae will be attempted from this closer position. Rosetta will remain in orbit about the comet past perihelion passage on 13 August 2015 until the end of mission in late September 2016, when the spacecraft will make a controlled impact on the comet's surface. Rosetta is funded by the European Space Agency. The total cost of the mission, including launch and operation was about $900 million before the launch delay. The mission was originally to rendezvous with Comet 46 P/Wirtanen. Flybys of two asteroids, 4979 Otawara and 140 Siwa, on the way to the comet were also planned. The mission was delayed due to problems with the Ariane booster. The delay has reportedly cost an extra $70 to $80 million. Family: Comet. Country: Europe. Engines: S400. Launch Vehicles: Ariane 5, Ariane 5G, Ariane 5Gp. Launch Sites: Kourou, Kourou ELA3. Agency: ESA. Bibliography: 2, 4061, 4062, 552, 554, 6832, 13031. 2005 March 4 - . Rosetta, first Earth Gravity Assist, Successful - . Nation: USA. Spacecraft: Rosetta.